Place 1 thin slice of Kraft Gouda Cheese on each Triscuit Cracker; top with a hot pepper ring and a few Oscar Mayer Real Bacon Bits. 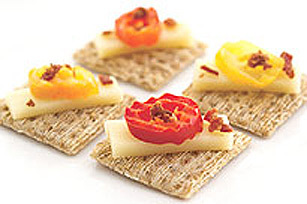 Place up to 8 topped crackers on microwaveable plate. Microwave on HIGH 30 seconds or until cheese is melted. Repeat with additional topped crackers, as needed.